Your boat is most likely one of your most important investments. If you are a boat owner, you are likely extremely passionate about your boat and the recreational activity it offers you and your family. 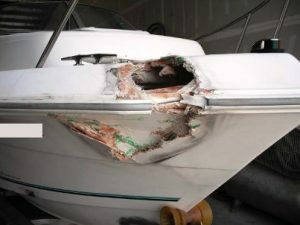 Over time, your boat may be involved in an accident, damaged in a storm, or simply need to have routine body work done to keep it in good working order. Anchor Marine Repair specializes in repairing all types of boats and restoring them back to excellent working condition. In addition to being a leading marine body shop, our team also has extensive experience working directly with insurance companies to be sure that you recover all possible costs. The team at Anchor Marine Repair shares a passion for boats with our customers. We understand that you do not want to pull your boat out of the water for repairs of any kind. However, in order to extend the life out of your boat and make the most of your investment, there are times when a repair is needed. Anchor Marine Repair is the #1 storm and collision damage repair facility in the area, and we have earned this reputation by combining the practice of old world craftsmanship, with state-of-the-art equipment, high quality products, cutting edge techniques and attentive customer service. When it comes to helping you with an insurance claim, you can trust the team at Anchor Marine Repair. We recognize that the customer is YOU and we will work to get back what you deserve with an insurance claim. We have established relationships with virtually every insurance company out there, and we have an established reputation with them as well as providing high quality repairs that stand the test of time. This is our business and the work we do every single day, so you can trust our team to handle this part of the process for you so that you do not have to! Anchor Marine Repair makes the repair process as easy as possible for you. We offer pick-up and delivery service within a 250 mile radius and have a two building, state of the art facility with 10,000 square feet of working space so we can repair your boat quickly, allowing you back on the water ASAP. If your boat needs insurance body work, call us today at 763-972-3540 to get started.